So I’ve been geeking out all day, and I’m not ashamed. I attended BEA09 just for today, even though the convention has been happening since Thursday. I went on my own, outside of work, so I didn’t take any days off to go. It was a whirlwind day spent going from one line to the next, getting autographs and galleys, and making several trips across the street to the lot with my car so I could dump all my goodies. Three trips to the car because I had too many great books to carry around. I didn’t get to as many of the conference events as I would have liked, but this just means that next year I’ll have to try and come for the full event. 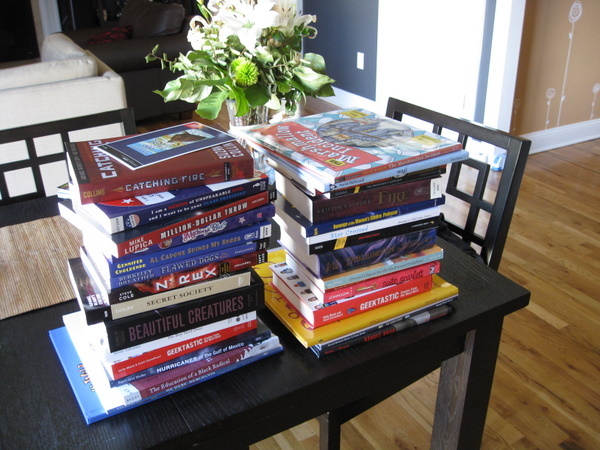 So my experience was mainly signings and galleys. There were defintely highlights. 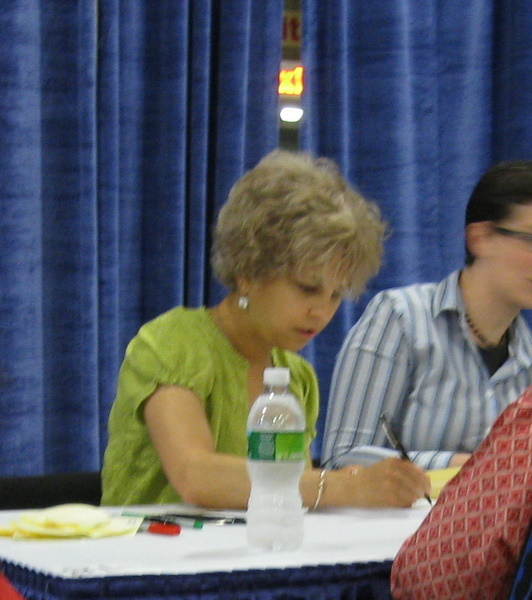 Kate DiCamillo did 2 signings, one walk-up for The Tale of Despereaux and one ticketed for her new book The Magician’s Elephant (due out in Sept. ’09). I managed to get to both signings, and I’m thrilled because I’m reading The Tale of Despereaux with some of my 2nd graders. It’s a tough book for them, but they have really risen to the challenge and love it. I can’t wait to bring the book in to school to show them. And since I love everything Kate DiCamillo writes, I’m thrilled to have my hands on an ARC of her latest book. I also met the incomparable Walter Dean Myers and his son Christopher, who have collaborated on several books including the upcoming picture book Looking Like Me. I got a signed poster and met the legend and son. 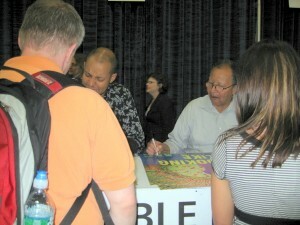 Ron and Judi Barrett (authors of Cloudy with a Chance of Meatballs) were signing their new book The Marshmallow Incident. I met Patrick McDonnell, signing his new book Wag! I scored galleys of Suzanne Collins’s Catching Fire, sequel to her hugely popular Hunger Games. Kristin Cashore signed Fire, sequel to her Graceling. I got Al Capone Shines My Shoes, sequel to Gennifer Choldenko’s Al Capone Does My Shirts (which I adore). Maureen Johnson signed Suite Scarlett, which I’d just started reading. Brandon Mull signed the newest Fablehaven book and his new picture book Pingo, Holly Black and Cecil Castelucci signed Geektastic. You get the idea. I have tons more, and lots of great books by authors new to me. Plus sequels to some series taking off that I haven’t found my way to yet. It was a great convention; there was a real feeling of community with everyone I spoke with-authors, librarians, booksellers. And now I have this giant pile of books to read, and I have no idea how long it will take me. I think I’m set for the summer…and possibly the rest of the year.